Celkon, an Indian Mobile manufacturer, continues to concentrates on entry level Android mobile phone specially after the successful release of the Signature HD A119 Android Smartphone which has Android (4.1 Jelly Bean) and packed with 12MP Camera. After the success of HD A119, Celkon has announced A58 Android mobile, which is a low-end device, with a price tag of INR 4199. Recently we have seen a lots of budget phones flowing in the market from the mobile manufacturer like Micromax, Intel and karbonn and so the competition will be interesting. 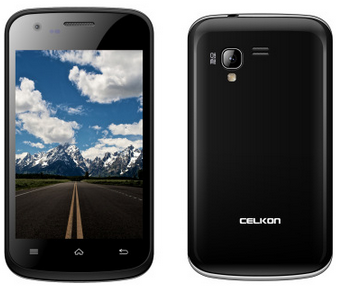 Celkon A58 run on Android 2.3 (Gingerbread) version and powered by 1GHZ Processor. This device could face a good competition from Karbonn A4 which is also coming with Android’s Gengerbread version and a same 4 inch display as Celkon A58 at, RS. 4800 INR. The A3 from Karbonn itself could be one more competitor for this device which have the same android version but a smaller display at Rs.3600 INR. It Could also face some good competition from Intex Aqua SX which will be coming with this android verion at Rs.4490. The device has got the dimension of measures 121.7 x 67.2 x 12.2mm, while it weighs just 85 grams and a 4-inch display with 800×480 Pixel screen resolution .It is a Dual SIM and Dual Camera Android phone and with Dual Standby support. It is equipped with 256 RAM, primary Camera of 3MP and front VGA Camera. There are many entry level/mid range Android mobile phones in the market, specially coming form the indian Manufacturer, varies in some features but more or less features will be same. The only thing which can create a impact is the appearance and it usually varies. So going through the specifications of Celkon A58 you will find it is less weighted mobile of 85g. So this light weight device can create a good impact on the user.